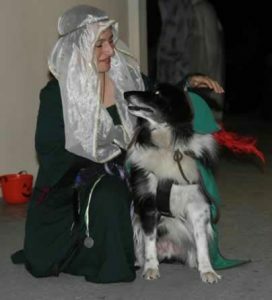 Halloween can indeed be a frightening experience for dogs, especially for puppies who have never experienced this event, and for shy dogs who are easily frightened. Think about it: Strange people in weird shapes keep ringing the doorbell, and they smell so sweet! And are you thinking that Fido would look really great dressed up in a cute costume? You may want need to do some training, first! Dogs are often suspicious of new things (this was a survival trait for their ancestors: wolves and wild dogs). Year-round, dogs can become frightened of firefighters (with their hard hats and big coats), football players (huge shoulders), anyone in a uniform (perhaps generalized from the postal worker who “invades” your property every day? ), and crosswalk guards (my dog Flipper was sure that the stop-sign the guard was carrying was part of her). Imagine how they will react to huge capes, princess hats, boxy-costumes, bells, flashing lights, oversized shoes, and all sorts of extra appendages! If your dog does become frightened of trick-or-treaters, or even yard decorations, the best thing you can do is be calm and cool. After all, you are not afraid of that child dressed like Darth Maul or that stuffed sheet blowing in the breeze! Do not force your dog to confront what frightens her. Just say something like, “Oh, that’s nothing, silly dog! Don’t worry about it”. If you can walk by, do so. If you can’t (if it’s someone approaching you), see if you can approach in a circle (in other words, not in a straight line, but circle around from the side). Be sure to keep your leash loose. Usually, if you are calm and even “jolly”, and allow the dog to investigate on her own, she will discover that it is harmless and will relax. On Halloween, the Scary Things will be coming straight to your front door and demanding things from you! Probably the least stressful thing you can do, all around, is keep your dog in the backyard or in a back room where she won’t have to see all of these scary people. Ideally, someone the dog knows and trusts will stay with her. You don’t have to focus on her, just be there for her. Lord Flipper of Lockesley – Take from the rich, and eat it all! Are YOU dressing up? 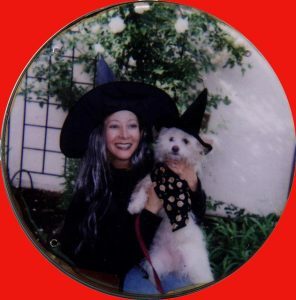 Don’t be surprised if your dog doesn’t recognize you or is frightened when you wear a wig or a large mask, or change your silhouette or how you sound. If possible, let your dog watch you put on your costume so she sees the transformation. If she’s still scared, stand sideways to her, and let her approach you. Don’t go towards her and don’t insist that she come towards you. Be calm and upbeat, and you can remove your mask or other costume pieces to reassure her that it’s still “you”! If she’s still not sure, you can give her some treats for sniffing the mask, then for not running away when you put it up against your face, then for obeying a command from you while you’re wearing it.Please understand (and convince your friends) that it is NOT funny to scare a dog who’s frightened by a Halloween costume. After all, aggression from a dog is not very funny, and even “nice” dogs may bite when scared. Does your dog already go ballistic whenever the doorbell rings? Just think about what it will be like when trick-or-treaters ring it every few minutes. Under normal circumstances, this would be the ideal time to do some training, teaching your dog to sit calmly and quietly while you open the door. 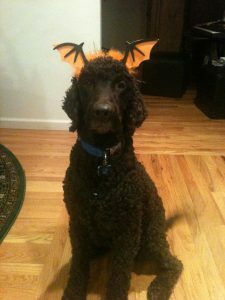 But Halloween is NOT normal circumstances – your dog might be frightened by the goblins at the door, or excited by the smells of candy. Again, your best move is to keep the dog away from the door. Let her shelter in her crate, or occupy her with a nice chew toy. Be sure to click or praise and reward her for ignoring the doorbell. Make sure your dog can’t escape out the front door when you open it! Candy is NOT good for dogs, but it’s going to be a highly noticeable aspect of the evening (remember how good dog noses are!). Again, good management is probably the wisest thing to use. Keep the candy out of reach of the dog. Candy is pretty bad for them, and chocolate can be fatal (bring extra chocolate to your dog trainer instead!). If your dog eats chocolate, immediately call the Animal Poison Control hotline at 1-900-680-0000. You want me to wear WHAT?? Thinking of dressing your dog up? There are a number of dog costumes available commercially, and a little creativity can go a long way. See the Events page for Bay Area doggy costume contests you can enter! Some dogs don’t seem to care what you put on them; others act like they are caught in a deadly trap and try to escape the strange sensation of a costume; most reactions are in between (If you have this very frightened kind of dog, perhaps a costume is too much. Consider a bandana instead!). og reacts to seeing the costume with a wagging tail and a look of expectation, you can then drape it on her body, and be generous with the treats. Don’t actually fit it on, just drape it. Shower those goodies and praise. Your dog will think this is the best game ever! Next, if your dog is eager and excited but not too out-of-control, put the costume on the dog, shower the goodies, and then quickly take it off again. If she got scared or struggled when you put it on, back up to where she is comfortable, then work your way through the steps again until he is comfortable. Don’t make your dog wear the costume for very long. Also, keep safety in mind – you should still be able to keep your dog on a leash, and if you’re going out at night some reflective strips (such as the kind you can get at sporting good stores for bikes) or flashing lights will help people and drivers see your pet. Make sure that your dog can still see and move comfortably, and that she can’t chew off and swallow any pieces of her costume! See also tips from the American Veterinary Medical Association. Last updated October 9, 2018 by Stacy Braslau-Schneck.